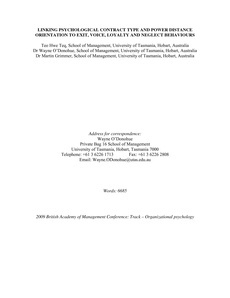 This study responds to the call for more research into the role of cultural values in the psychological contract by considering the links between relational and transactional psychological contract types, the cultural value of power distance orientation measured at the individual level, and the behavioural responses of Exit, Voice, Loyalty and Neglect. A theoretical model is developed and four hypotheses are examined using data collected by the administration of a survey questionnaire to a sample of 223 university student. The results indicate that psychological contract type and power distance orientation interact as hypothesised to shape an individual’s behavioural response to perception of psychological contract breach. Implications and suggestions for future research are discussed.